Welcome to the Mushroom Farm! 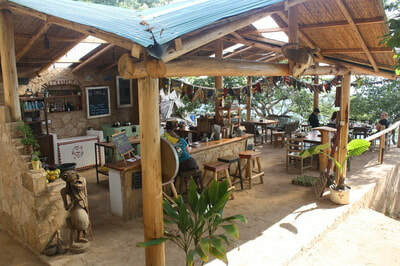 Overlooking the Great Rift Valley and breathtaking Lake Malawi, the Mushroom Farm Eco-Lodge offers a magical setting. We are environmentally friendly: enjoy mountain spring water, solar energy, composting toilets, and permaculture gardens. OPERATING as a social enterprise, WE believE in responsible tourism, sustainable community development, and local empowerment. we donate 10% of mostly sales to community projects. ​​Thank you for your support! WE LOOK FORWARD TO MEETING YOU! ​PLEASE EMAIL US WITH ANY QUESTIONS! A sneak peak of the Mushroom Farm! ​Mushroom Farm has been awarded the 2015/2016/2017 Trip-advisor Certificate of Excellence. The Mushroom Farm offers a comfortable base for travelers to rest and recharge their batteries while enjoying the simple luxuries the mountain has to offer. We believe in self-sufficiency and a permaculture lifestyle. We are 100% off-grid; our water comes from a natural spring, our electricity is from the sun, and we use composting methods to feed our gardens-- which in turn, gives us nutritional and organic produce. We are also a community based social enterprise. This means that the profits created by the lodge are fed back into the community. Guests will relish the full day-treks to the surrounding attractions, indulge in the farm-to-table vegetarian dishes, relax in one of the many hammocks dotted around, refresh with our yoga forest deck, or cozy up with a book! So come and soak up the sun, laughter, and healthy lifestyle offered on the mountain. Thank you for supporting our cause! We look forward to meeting you!